German Chancellor Angela Merkel plans on working closely with Western Balkan countries to bring them closer to the EU, a process she initiated by hosting a high profile Western Balkan Conference in Berlin on Thursday (28 August). EURACTIV Germany reports. All seven successor states of the former Yugoslavia, as well as Albania, have a “European perspective”, German Chancellor Angela Merkel said on Thursday (28 August) at the much-anticipated Western Balkan Conference that ended with optimism for the region’s EU integration. “All states in the Western Balkans should have the opportunity to join the European Union if they fulfill the accession requirements,” Merkel emphasised. 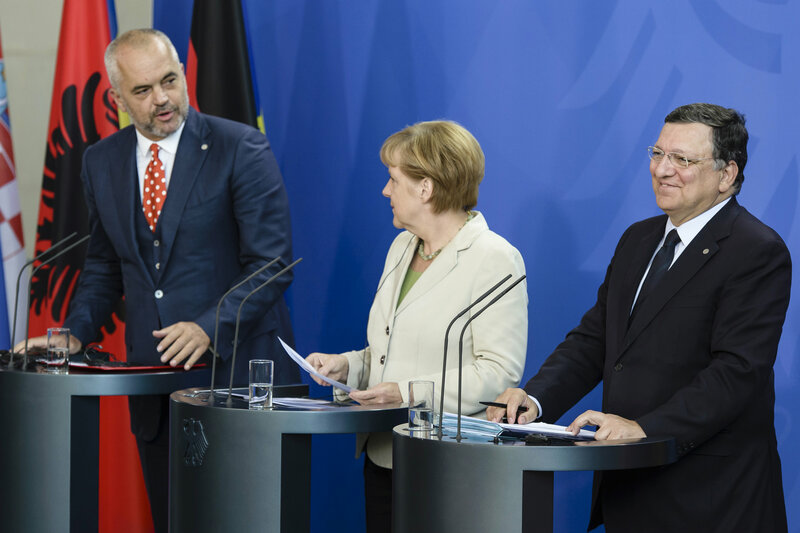 The Chancellor spoke in the Federal Chancellery during a joint press conference with European Commission President José Manuel Barroso and Albanian Prime Minister Edi Rama. Rama also serves as chief of the South-East Europe Cooperation Process (SEECP). Before the start of the Western Balkan Conference, Barroso had a one-hour meeting with Merkel, where the two exchanged views on the upcoming EU special summit and the developments in Ukraine. Government leaders, EU representatives and economic and foreign ministers from Western Balkan states, Slovenia and Croatia participated in the Berlin event. The conference was a continuation of the so-called Brdo Summit in Dubrovnik, Croatia, which Merkel attended in July. The goal of the Berlin conference, initiated by Chancellor Merkel, was to strengthen cooperation between the regions and explore the states’ perspectives for EU accession. At the press conference, Barroso outlined the shared interests between the EU and the Western Balkan region. “Our common goal is clear: We want to see the Western Balkan countries ultimately join the European Union. This is in our joint political, economic and geo-strategic interest. This is the right way to defend the long term prosperity of all the citizens in our European family and also to defend European stability,” he said. He emphasised that further EU accessions, “depend on our partners’ own speed of reforms. But they will happen over time. We don’t want to leave any doubt about it”. All participating countries hope the accession process will move forward quickly, Merkel said. But it is up to the individual countries, the Chancellor pointed out, to fulfill the high expectations of their populations. Most of all, the people hope for “economic advancement and measures tackling unemployment”, she said. The process initiated in Berlin is expected to continue and be converted into a longer working process. The next host is expected to be Austria in 2015. A firm commitment to these countries’ EU accession was given in Thessaloniki in 2003 during the Greek presidency’s EU-Western Balkans summit. Since then, Montenegro and Serbia have received a green light to start accession negotiations, Macedonia is a candidate country, and Albania is expecting to get the same status. Bosnia and Herzegovina is the country that lags behind the most, while Kosovo’s unresolved international status is still a cause for headaches in the Union. However, in the last 11 years, progress has been uneven, and countries such as Macedonia or Bosnia have been stuck on their path towards the EU. While Bosnia and Herzegovina is dealing with important domestic challenges, Greece has prevented Macedonia from starting accession negotiations for the past six years, despite a clear recommendation from the EU executive, a blockade which has fueled a deterioration of democratic standards in the country. EURACTIV Greece: ?? ???????? ??????????? ??? ????????? ?????????? ??? ???????? ??? ???????? ??? ?? ???????? So what went wrong in Ukraine when not all the population was in accord?